Discussion about the relationship between business and society – and more specifically corporate purpose – is moving into the mainstream. In some quarters, there is still a standoff between the advocates of shareholder value and of stakeholder value, but companies embracing social activism are not the only firms today that reject a laser focus on share price. The broader zeitgeist now extends to major financial institutions looking to discover their social purpose. Recently the world’s largest investment firm, BlackRock, has drawn attention to the need for business to be focused on more than just the bottom line and to make “a positive contribution to society”. On one side, shareholder value maximisation proponents say the purpose of business is maximising financial returns to shareholders. On the other, many and often quite disparate companies (and others) say that social purpose is the key to business in society. Rather than one single right way to generate profit and/or social welfare from business, we suggest that there is a continuum of possibilities. In our paper, “Alternative Objective Functions for Firms”, we define the different potential relationships firms can have with profit and social welfare, creating a diagnostic and analytic tool to help organisations clarify the approach that best aligns with their vision. We encourage executives to think deeply about their firm’s purpose and ask whether it has the right emphasis on profit and social welfare. Firms need purpose to thrive, yet they can't survive without tending to their economic foundations and requirements. Our taxonomy in Table 1 captures the variety of nuances. Unlike profit, social welfare can be interpreted in a much greater variety of ways. It can mean anything from addressing – to varying degrees – environmental and social issues, to stakeholder value maximisation. In this project, we consider social welfare in its broadest sense; others may use the terms stakeholder value or sustainability to capture the same idea. The relationship between profit and social welfare can take on multiple different forms depending on what the firm values most and whether these goals are mutually supportive or conflicting. Table 1 shows the range of options across a continuum, from organisations with an emphasis on profit to those with an emphasis on social welfare. Beginning with profit, in the case of Simple profit maximisation (1), a firm exists to maximise profit and this guides managers’ decisions. 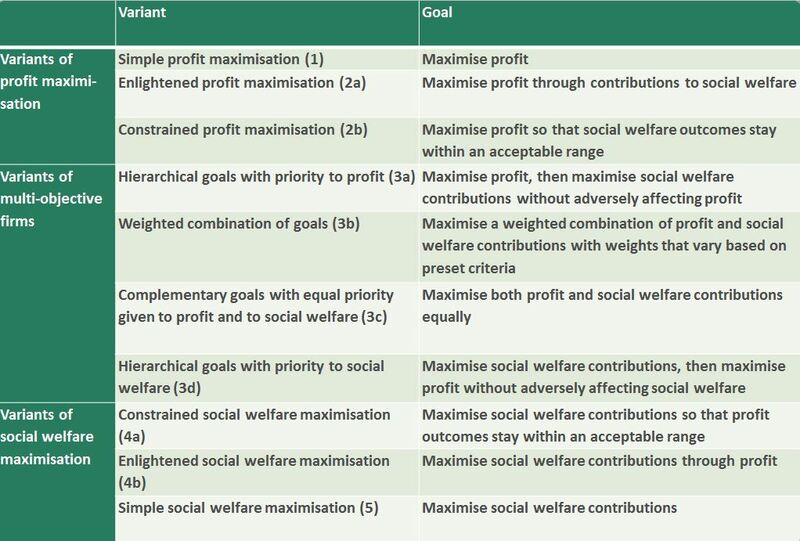 Another view – Constrained profit maximisation (2b) – regards profit as imperative, but social welfare is also explicitly considered. While in 2a, profit maximisation is a beneficial consequence of social welfare, in 2b profit maximisation is constrained to ensure that a level of social welfare is realised. This might, for instance, mean that employees are protected from layoffs in difficult economic times. For firms with multiple objectives, both profit and social welfare maximisation are goals, but the way that they relate to one another differs. Moving along the continuum towards social welfare, Hierarchical goals with priority to profit (3a) is a view that companies should set and order their end objectives in a hierarchy. In this case, profit may come first, but social welfare should be considered but not in such a way that it is deleterious to profits. In the Weighted combination of goals (3b) alternative, managers must assign weights for profit and social welfare, basing their decisions on these interests. Complementary Goals with equal priority given to profit and social welfare (3c) prioritises both profit and social welfare equally. The mission statement of Danone, for example, recognises the “dual project for business success and social progress”. Stating that profit and social welfare are equal objectives is not uncommon for companies; yet, this option is only available under certain conditions. Companies that prioritise social welfare while slotting goals into a hierarchy adhere to Hierarchical goals with priority to social welfare (3d). Firms that follow this path are generally social enterprises which reinvest profits back into the social purpose aspect of their business. Firms in these categories put social welfare first, to one degree or another. Constrained Social welfare maximisation (4a) directs managers to increase social welfare as much as possible while remaining with an acceptable range of profit. Other organisations’ first priority is to contribute to social welfare through their profits, which we call Enlightened social welfare maximisation (4b). “To discover, develop and provide innovative products and services that save and improve lives around the world” is the mission statement of the pharmaceutical giant Merck. Achieving a fair rate of return for its shareholders is crucial to Merck, and companies like it, in order to fund the investment required so that all its stakeholders benefit. Products are mentioned but the company’s purpose is a social welfare one, with profit as an instrument for realising this. To be clear, we do not advocate for any particular business purpose model. Depending on your organisation’s goals and your own role, the following questions can help orient your firm. What could be our organisational purpose? Transcending the traditional shareholder vs. stakeholder debate, we bring nuance by proposing ten shades of grey in the role of business. Consider your own organisation and go beyond simplistic notions of profit or do-gooding. There are a range of possibilities. In practice, what is our organisational purpose today? This is a nuts-and-bolts question that looks at the trade-offs between profit and social welfare. An increased specificity about your organisational purpose should help you to better understand and respond to stakeholder pressures to “take into account” objectives other than profit. What should our organisational purpose be? The question of organisational purpose is fundamental to your business in so many ways, from why it exists through to how it functions. Managers’ beliefs about desired outcomes and how they can be realised are likely to drive your conception of where on the continuum your firm sits. Of course, when formulating the balance of your corporate model, economic constraints must be considered. Some are a function of the industry; others are a function of the financial situation of the company itself. Indeed, a company can find itself in a financial crisis because too much focus has been placed on social welfare and not enough on profit. There may also be limitations in terms of the values of the company, and the values and expectations of its stakeholders, especially in a social enterprise or a family firm. Consultants should also find the framework helpful in advising companies on corporate purpose. Equally, policymakers and NGOs can use our taxonomy to evaluate organisations and propose an optimum profit-social welfare relationship, as they see it. Take stock of the underlying concept behind your organisation’s goals; empirically look at how your organisation really runs; and finally create an ideal purpose for your firm. The relationship between profit and social welfare is fundamental to your organisation’s purpose. Craig Smith is the INSEAD Chair in Ethics and Social Responsibility, the Programme Director of the INSEAD Healthcare Compliance Implementation Leadership Programme and a specialist professor at the INSEAD Corporate Governance Centre. He is also programme director of the Ethics and Compliance Leadership Programme, and a member of the Scientific Council of social responsibility rating agency Vigeo Eiris. His latest book (with Eric Orts) is The Moral Responsibility of Firms. Leena Lankoski is a Senior University Lecturer at Aalto University School of Business, Helsinki, the School of Business Programme Director of the Creative Sustainability Master’s Programme at Aalto, and a Visiting Scholar at the INSEAD Social Innovation Centre.